This category pertains to all things involved with KipwareQTE® – cost estimating software and KipwareCYC® – machining cycletime estimating software and KipwareTRK® – Machine Shop Quotation Tracking and Analyzing Software. If you have followed our Blog … you might know that back in October of 2015 we started a sister company to Kentech Inc. called KÄRV. 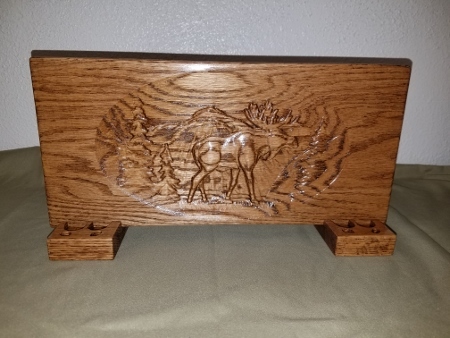 KÄRV is a woodworking business … is just getting started … and will be producing custom, handmade furniture and unique wood carvings for resale. We are using the Kipware® software from Kentech Inc. in KÄRV to both create the G code programs for our X-Carve CNC router and to estimate cycletime and costs for the products we will be producing for resale. So we are putting Kipware® to the test in the real world … this time the world of woodworking … for additional in-the-trenches use. 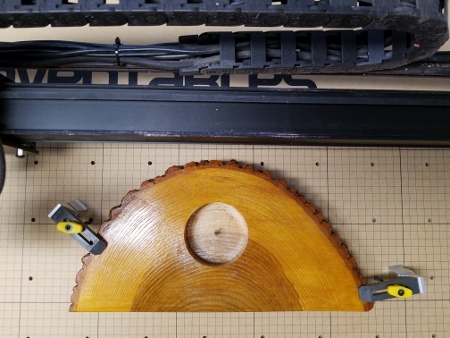 We also wanted to document some of the use of Kipware® in various areas of KÄRV … so this post is dedicated to the cost estimating of a wooden, 3D carved plaque we have for sale on our website. We wanted to illustrate through the video available below how we used our KipwareQTE® to create the retail price for the plaque considering material cost, tooling cost, labor cost and non-machining costs. Metalworking … woodworking … they both have very similar aspects as they relate to manufacturing … so this video is a great way to see KipwareQTE® in action in a woodworking environment … but with a lot of similarities with a metalworking one. For additional information on all our Kipware® CNC and Machine Shop software titles … please visit www.KentechInc.com. At Kentech Inc., we have spent a lot of time over the last 25+ years working and perfecting our KipwareCYC® – Machining Cycletime Estimating Software. KipwareCYC® started out as a resource for estimating cycletimes for machine purchase justification. Clients would come to us with the request to estimate machining time based on equipment they were considering purchasing. THIS WAS A BIG DEAL to be sure. The client was going to lay down some serious cash to purchase a new piece of CNC equipment … based heavily on our cycletime estimate to machine their workpiece on that equipment. Well over the years we have produced quite a few happy clients … enjoying a nice revenue increase thanks to those cycletime estimates and new equipment purchases. So we know a little about accurate machining cycletime estimate … from hands on experiences. Cutting parameters used in the estimate MUST reflect the speeds and feeds being used on your shop floor during the machining. Using book knowledge … pie in the sky parameters … other people’s data and processes … will only lead to inaccurate estimates. This is one of the fundamental keys to accurate machining cycletime estimating. You can read more about our feelings on this issue in our previous BLOG post … CLICK HERE to read that post. The time that a tool is actually engaged in the cut … the “length of cut” … is the most accurate way to estimate that tool’s cutting time. Using other factors like volume of material being removed … does not accurately reflect a tools cutting time. The volume of material being removed does not reflect the path the tool takes in the cut … only the amount of material being removed. The path the tool takes in the cut … the true length of cut … is the only factor that will produce an accurate cutting time. Our KipwareCYC® application always has used a tools length of cut when calculating cutting time. Coming from the shop floor … we also realize that this is not an easy factor to obtain. That is why we created our companion app for KipwareCYC® … the Cut Length Calculator. This ingenious application uses a mix of conversational, fill-in-the-blank forms as well as the ability to import DXF files yto assist the user in calculating a tool’s length of cut quickly and easily. Our patented Machinist Mode transforms the mouse into a cutting tool … all the user need do is click around the part to simulate the cutter path … and CLC will turn that into a length of cut calculation … for either turning or milling calculations. For more information on the Cut Length Calculator … included standard with KipwareCYC® … we invite you to watch the video below. Quoting and estimating is the lifeblood of your business … and any accurate quote begins with an accurate machining cycletime estimate. It is undoubtedly STEP #1 !! We invite you to check out all the features and power of KipwareCYC at our website … http://www.KentechInc.com/KipwareCYC.shtml. After 30+ years in the metalworking industry … we are about to expand our scope as I TAKE MY TALENTS TO … WOOD !! On October 22, 2016 … KÄRV was born !! Personally I have been dabbling in woodworking for quite a while and I felt the time had come to take it to the next level. I mean why not?? Through Kentech Inc. we have developed all the software needed to operate a manufacturing business through our quoting and estimating … CNC programming … and shop utility software. 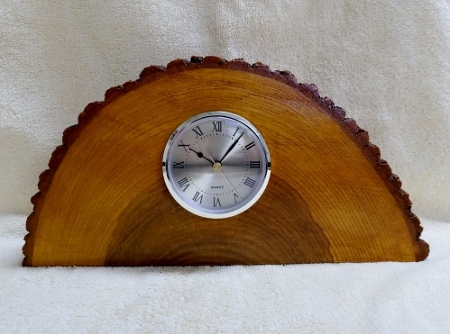 When you come right down to it … making products from wood is very similar to making products from metal. A collaboration between Kärv and Kentech is a NATURAL !! We invite you to follow our progress along here at the Kipware Blog and on our CNC Machinist Blog as we rev up. We will be detailing our progress as we receive and set-up our X-CARVE cnc router from Inventables. We we will be illustrating and blogging all the steps from unpacking to first cut at the blogs … so please follow along. After we get the X-CARVE up and running we will be illustrating and blogging about how we integrate our Kipware® quoting and estimating software and Kipware® programming software into winning work … and producing work !! … so please follow along. We will also be publishing more on the offerings from Kärv on the Kärv website … www.KarvWoodworking .com. So please visit the website as well. Who knows … you might even find some items of interest for yourself or for gifts. We tout this fact all the time in our marketing … at Kentech Inc. we are MACHINISTS … we cut chips, we programmed, we ran shop floors for years … then we became software engineers and designers and built software products we saw were lacking during those years. What we refer to as Real World Machine Shop Software. As a result, many of our clients come to us to take advantage of that experience … especially those just starting out. Since quoting and estimating is one of the first tasks a new shop needs to get right … we get asked quite a lot of questions about these areas. Our KipwareCYC® ( machining cycletime estimating software ) and KipwareQTE® ( cost estimating / quoting software ) titles are two of our most popular titles. One of the “hot” topics we encounter during online presentations of these titles is often concerning the cost to charge for a machining or a shop rate. So we thought it was a good time to add a blog post with some guidelines we feel are simple enough … but important enough … that can get you to an accurate figure. Equipment – Cost Per Hour of Operation … a common formula : (machine purchase cost + expected lifetime maintenance cost) / expected hours of operating life. Once the above costs are calculated … you can use the formulas and guidelines below to arrive at either a “general” shop hourly rate or an hourly rate based on a specific piece of equipment. Somewhat simplified … and usually a work in progress as factors may change. It is important to gather all the figures in the formulas above as best you can … as accurate as you can … and to keep tabs on any factors that may change along the way.